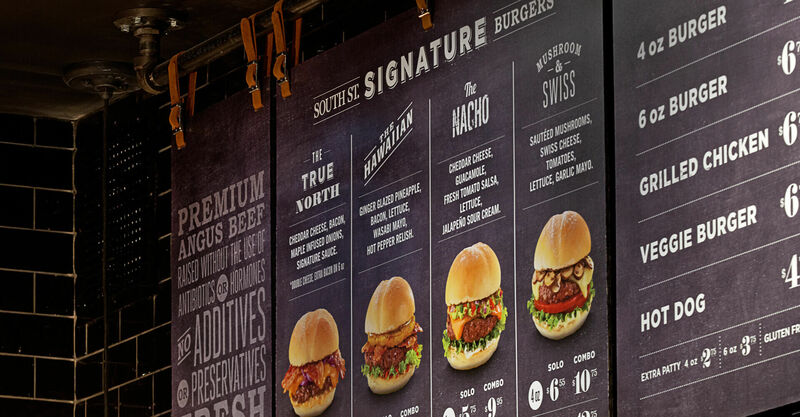 It’s difficult to ignore the winning combination of value and atmosphere that’s helping the burgeoning fast-casual segment win market share, and the team at South St. Burger has upped the ante. More like a pub than a typical fast-casual burger restaurant, the evolution of the South St. brand to the burger bar concept is as natural as their ingredients. 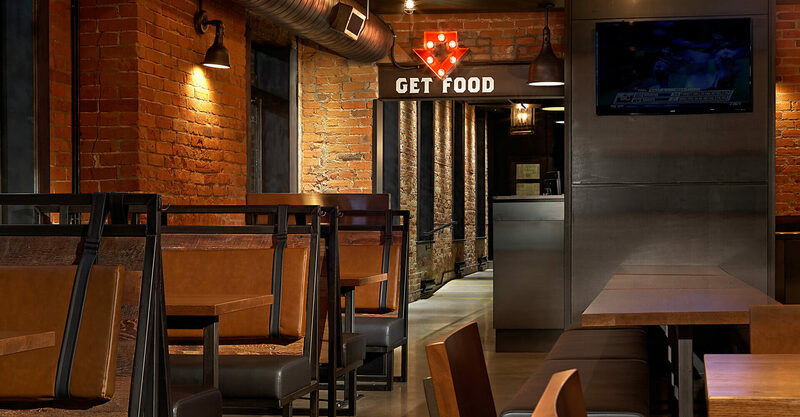 Located in a heritage building in gentrified Corktown, the South St. burger bar concept serves a young and vibrant community that was in need of a gourmet burger spot and watering hole. 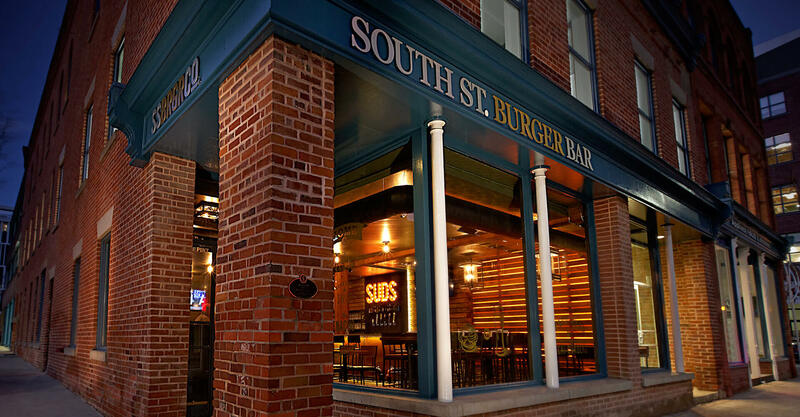 This demand afforded the opportunity to evolve the South St. Burger concept into a more adult environment and create a space in harmony with the surrounding architecture. 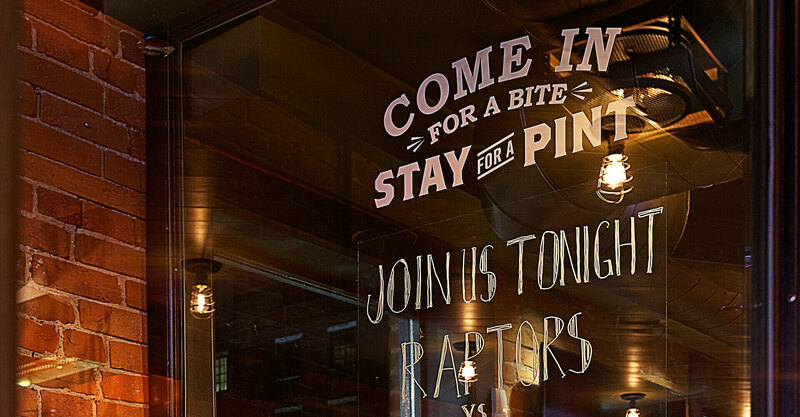 The result is an upscale burgers and beer restaurant where the game is always on, but good conversation is the focal point. Patrons can catch up with friends and share tasting combos over a flight of beer, tuck into gourmet sliders and their favourite bottle, or pair a pint of craft beer with a craft burger, knowing that only the finest ingredients and attention to detail have gone into both. The restaurant can be both a typical lunch destination for the business crowd, or a post-work social gathering spot for locals. For passers-by, the warm glow of the signature rear-illuminated wall beckons through tall glass windows; once visually engaged, patrons will discover finishes that appeal to both their culinary and architectural senses. 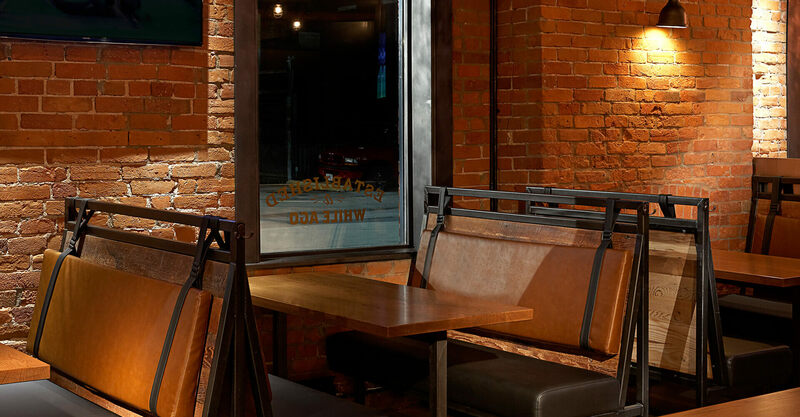 Milled steel menu panels hang behind warm concrete countertops above polished concrete floors, and the space is infused with reclaimed hemlock, gas pipe, and Edison lamps that harken back to the rugged industrialism of original Corktown. Existing timber posts and beams and exposed brick complete the connection, merging modern style with historical sensibility. 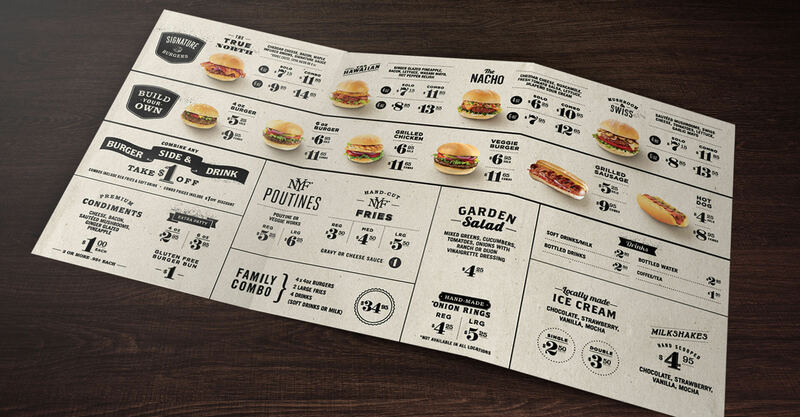 The unique layout is comprised of three separate buildings, and the corresponding transitions effectively isolate the food offering from the bar. 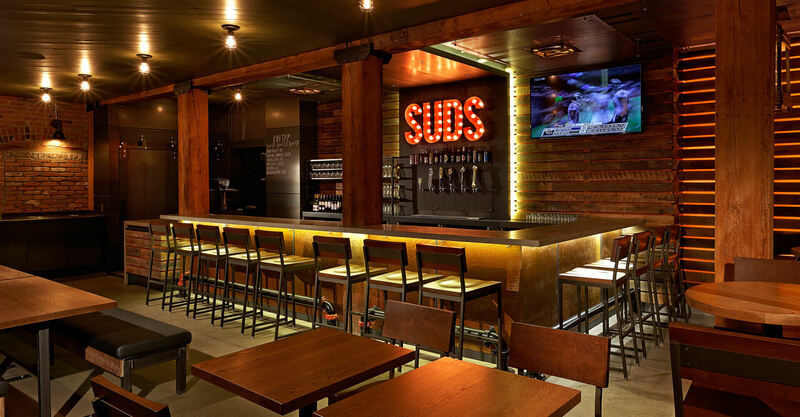 This created a natural separation of the fast-casual food service element from the more comfortable dining experience, inviting customers to quickly get their food and either carry out or settle in to relax and enjoy it with a beer. The food counter itself is traditional South St.; burger lovers place their order, can watch it being grilled in front of them and topped with the finest gourmet ingredients, and take their seats. Runners will bring the meal out to patrons, in a reflection of the South St. customers’ expectation of service beyond fast food and more towards casual dining. 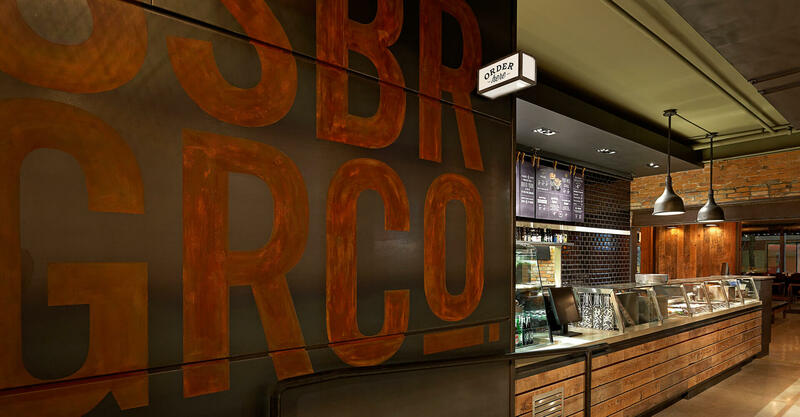 In the bar area, minimal branding and messaging further delineates the divide between the fast-casual food offering and the finer, more comfortable lounge. 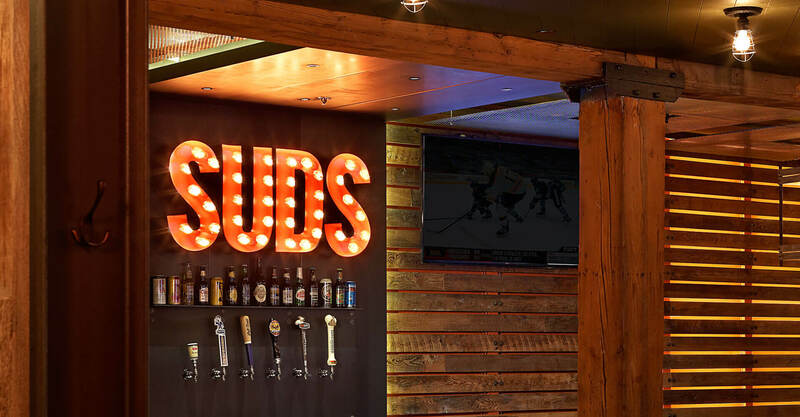 The marquee-style “SUDS” signage behind the bar defines the space and is playfully reflected in the similarly styled arrow and “GET FOOD” combination above the door, pointing customers back to the food offering. Traditional bar seating is highlighted by under counter lighting, while long bench communal tables promote camaraderie and group gatherings. Booth seating provides a more relaxed dining experience for those who seek it. 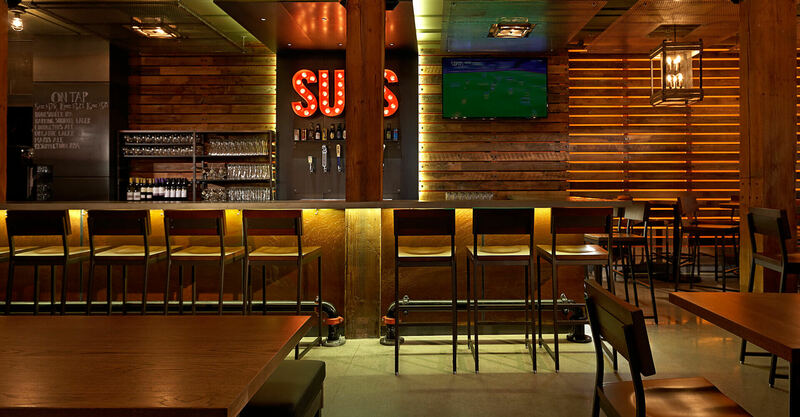 The South St. Burger Bar concept is uniquely Corktown, but could easily and effectively be adapted to fit similar gentrified areas in almost any city. 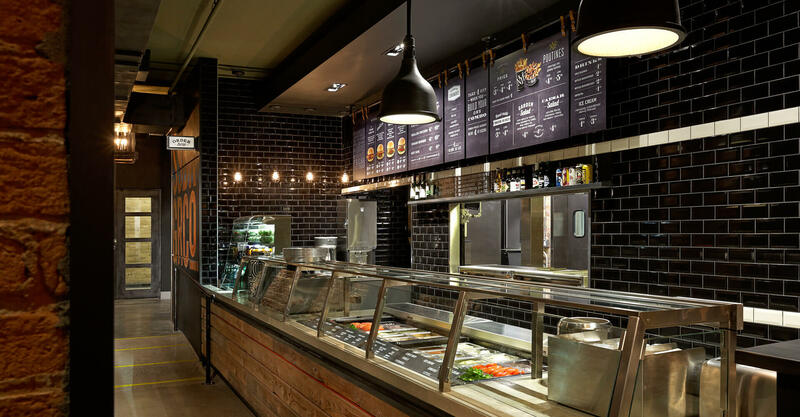 The addition of a more casual, adult-oriented dining setting to this already successful fast-casual food offering is an exciting evolution of this young but up-and-coming brand.